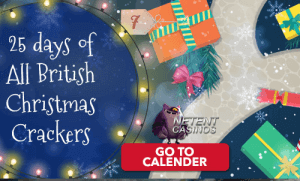 Known as the dark days of December, the days aren’t as dark as they seem at All British Casino with a total of 25 Casino Christmas Promotions including free spins offers, casino bonuses, and more. It has been Christmas all month already at All British Casino and another 12 windows of the Christmas Advent Calendar have to be opened. 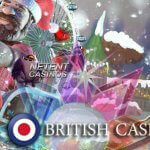 Today this British NetEnt Casino comes with a free spins offer involving the three NetEnt Christmas slots. Choose between three different free spins offers for the Christmas video slots while getting into the Christmas spirit as well. It was in 2015 NetEnt launched two Christmas Editions turning two existing slots into Christmas-themed games. I wasn’t filled with joy I have to admit, but last year’s launch of the Secrets of Christmas™ made up for it slightly. This year no Christmas-themed slot is being launched and, therefore, we have to be happy with the three Christmas-themed NetEnt slots available. I’m talking about the two Christmas Editions including Flowers™ Christmas Edition and Fruit Shop™ Christmas Edition, as well as the Secrets of Christmas™ slot. Of all three Christmas video slots developed by NetEnt, I definitely prefer the Secrets of Christmas™ slot offering its players a traditional Christmas. The Secrets of Christmas™ slot is offering a great ambience, bringing you the perfect Christmas spirit filled with joy. I’m sure you’ll appreciate all traditional aspects of Christmas which can be found on the reels such as the garlands, the golden church bell, the Christmas stockings, candles, and the Coca-Cola type of Santa Claus. Like it was the case last year during the 25 days before Christmas, it’s also this year that we see The Gonz (from Gonzo’s Quest™) dashing through the snow to lead you to the next present. And let’s be fair, we all love Gonzo, especially when he’s bringing us another great casino promotion at All British Casino. The great thing about the Christmas Advent Calendar is that a new Christmas Casino promotion will be available every day and all you have to do is follow Gonzo. The moment Gonzo presents you the offer, it’s up to you to decide what to do. Sometimes logging into your account is already enough to activate a free spins offer while today, for example, a deposit can end up in you receiving an even more attractive free spins offer. 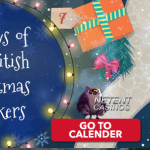 As always, All British Casino has a focus on the NetEnt slots, the reason why many of the Christmas Advent Calendar offers involve either the Secrets of Christmas™ slot, Fruit Shop Christmas Edition™, Flowers Christmas Edition or all three of them. Offers have been available for all three of the slots, but it’s for the first time that the choice is actually yours while more free spins offers are on the way for Blood Suckers™, Warlords™, and the NetEnt Rocks slots. More reason to keep on following The Gonz dashing through the snow this December! 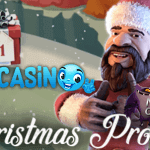 Three Christmas slot offers: the choice is yours! Today, there are three different type of Free Spins offers available for all Christmas video slots at All British Casino. A deposit of £10 is already enough to be awarded 10 free spins for Fruit Shop Christmas Edition™. 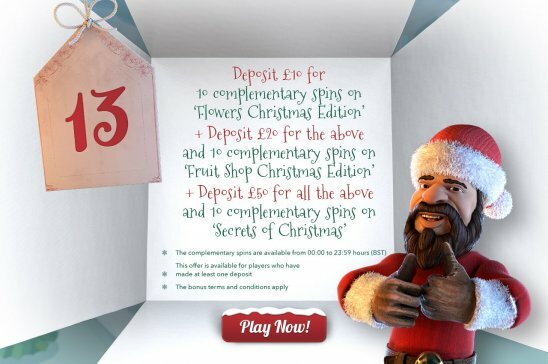 However, you might be interested in 10 Super Spins for the Secrets of Christmas™ slot which are worth much more than the free spins and will be activated when you deposit £20 or more today. If you deposit £50 or more today, 10 massive Monster Spins for Flower Christmas Edition™ is what you can look forward to. If not a player at All British Casino yet, you can first look forward to a very generous welcome offer including a huge 100% welcome bonus up to £100 and a massive 100 free spins for Starburst™, Pyramid™ or Aloha!™.